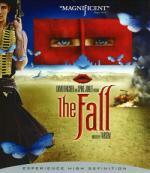 Filmed over a period of 4 years in 18 different countries, Tarsem's The Fall is an unforgettable movie experience. In 1920s Los Angeles, Alexandria (Catinca Untaru), a 5-year-old girl hospitalized from a fall, strikes up an unlikely friendship with Roy (Lee Pace, TV's "Pushing Daisies"), a Hollywood stuntman shattered by a near-fatal movie set accident and his lover's betrayal. To pass the time, he tells Alexandria the epic story of Governor Odious and the 5 remarkable heroes determined to defeat him - a dazzling world of magic and myth. Only when the line between reality and fantasy begins to dissolve does Alexandria realize how much is truly at stake. Presented by David Fincher (Fight Club) and Spike Jonze (Adaptation), The Fall is an awe-inspiring, cinematic tour de force. There isn't really much to say for me about this film. The story is held rather simple to make room for the BEAUTIFUL, jaw-dropping imagery. It is, however, not that simple to become entirely boring. Especially in the later part, when story and reality begin to mix there is some inspired moments. The director is Tarsem who previously made The Cell, which had a boring story but was also full of beautiful images. Almost none of the actors appetared in any other film of my collection. That is not to say they didn't act well. The little girl reaches her limits quite a few times, but all adult actors do a good job. I found the film to be inspired by Baraka as several locations can be recognized throughout the film. I haven't heard of this one. It does sound interesting though. I wouldn't have known about it myself if it wasn't for the review at (Cool) Shite on the Tube. Apparentyly it didn't have loads of advertisement going on during its (small?) theatrical run. I got this on Blu-ray for my birthday I think and haven't gotten around to watching it yet. But I have heard good things about it and do enjoy Lee Pace, so I'm very much looking forward to it now! Thanks for the review. If you already own it, watch it! I would like to point out that the film is rated R for a reason. There is few scenes in the film that can be disturbing for younger viewers. Not a problem. I'm careful of what I let me kids watch. Not as careful as my wife of course , but I wouldn't let them watch R rated material at this point. I've got the UK DVD, but haven't watched it yet. It is rated 15 and AFAIK the only difference to the US release are 3secs of animal cruelty being cut. I plan to watch it this weekend with a few friends, including one with a 14year old daughter. Is there anything besides the mentioned scene that warrants the R rating? It's not particularly gory, I just thought that certain scenes were rather intense and may disturb some younger viewers; among other the climactic scene is quite intense (giving details may spoil it). I know that Mark's kids are still rather young so I wanted to point it out. In overall it's a happy ending so I think if you know the 14 year old and you watch it together is should be fine. The film is very beautiful, but the theme is an adult one (not the Jimmy-adult kind ) and may not appeal to younger ones. Now I am curious, let me know after if in your opinion I was exaggerating once you've seen it. These thigs are obviously subjective and mileage may vary. I'll admit, I already forgot what the animal cruelty was. I finally got around to this one over the weekend. I enjoyed it very much. I am a little surprised by the R rating. I'd say it's a very close call. Except for the claymation scene , it really wasn't too bad. I wouldn't be afraid if my 12 year old saw it, but I'm not going out of my way to make sure he does. Or maybe it's a good thing my wife has more sense than I do. Anyway, it was a very enjoyable movie and I'm glad I finally got around to it. I was trying to be careful. Not having kids myself (and my niece and nephew, now both around 20, 10,000km away) I am not always sure what is and is not suitable for today's youth. I'll take your comments as guidance in the future. Besides the one more graphic scene I thought it was a more psychologivally challenging film, which, depending on the kid, could cause quite some excitement while watching. Not sure if all parents will agree, but some people say that scary stories/movies are good for kids, provided there is positive outcome at the end. I was trying to be careful. Not having kids myself (and my niece and nephew, now both around 20, 10,000km away) I am not always sure what is and is not suitable for today's youth. It isn't true that the kid must be protect from everything. They must learn that the life isn't a Disney film and the best teacher for that is their parents.